It's funny how insistently objects lie waiting for you. I'd had William Carlos Williams on my mind, and was looking for a volume of his poems that I had. Small, blue, library binding. I could picture it perfectly. I could smell it too. I love the intimacy of books, how well you get to know them. How, in your mind, you can picture their location on a shelf, just the way when, thumbing through a book for a passage, you can find it by your focus on just the right part of a page. "Top left, top left," your instinct whispers, and there it is. These things stick in your head. But the book wouldn't be found. It wasn't in its regular spot. I hunted up and down, throughout the house, but couldn't find it anywhere, and the more I looked, the more anxious I became. I had to remind myself to calm down, and let it be. The poems would return when they wanted to. Instead, another Williams work presented itself - The Doctor Stories, a New Directions book compiled by Robert Coles. I'd been given it twenty-five years ago, and though I'd loved reading it, I don't think I'd looked at it for a couple of decades. It was that time again. I put it aside, ready. Later in the week I found myself in Dumbo. I'm not in Dumbo much. It's such a peculiar mix of absolute beauty and numbing sterility I can hardly bear it. But there I was anyway, and after a couple of stiff shots of bridge and water I walked over to powerHouse Books. They have a nice collection, but it's on the small side. I thought I was only browsing - I had a bunch of books in line at home - but there on a table was just what I didn't know I needed. 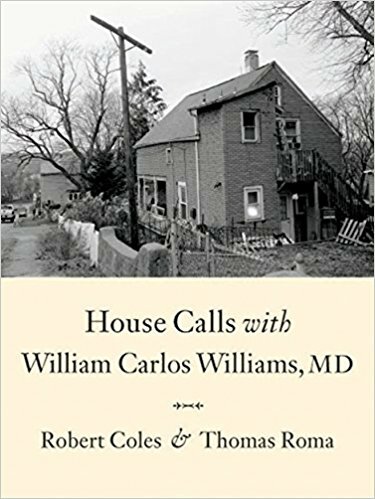 House Calls with William Carlos Williams MD. Often, before we began "house calls," (as he called them), Dr. Williams was quick to tell his young listener to "look around, let your eyes take in the neighborhood - the homes, the stores, the people and places, there waiting to tell you, show you something." It was as if to this traveling and now talking "doc" (as he wanted to be called by the "folks" in whose homes he came - "Doc Bill" or often "Doc W," not Doctor Williams), there were voices out there, in buildings as well as individuals, having their always available say, if only we "passers-by"would willingly "give them a hear. let them get to you." Contemporary photographs by Thomas Roma accompany the text, and I can't recall a more sympathetic collaboration. With Coles' assistance Roma re-traced the routes Coles and Williams traveled together, and his pictures - exquisite in mood and tone - capture the same spirit and beauty of the blue-collar people and streets that student and doctor saw half-a-century earlier. It's all in the eye. secret - into the body of the light! I could slip this narrow book into my pocket and carry it always.